As a popular insulation solution, polyurethane foam insulation is a high-performance alternative to other traditional insulations. Spray Polyurethane Foam (SPF) insulation provides both thermal insulating value and a superior air barrier. What components make up this type of insulation? What are some common uses for spray insulation? For starters, polyurethane foam insulation, also known as SPF insulation, foam insulation, or sprayed insulation, is a two-component liquid insulation material that, after you spray it, insulates and air seals wherever you apply it. Spray foam insulation comes in two large 55-gallon drums, a resin and an iso. You must keep the two liquids separate until you apply SPF at a job site. During the application process, the two liquids travel via a heated hose to a spray gun where they combine in a foam machine to create the product. The foam expands within seconds to fill a cavity surface. Depending on whether you are using closed-cell or open-cell foam, the product expands anywhere from 40 and 100 times its size during the application process. SPF contractors commonly use open-cell and closed cell spray foam in residential and commercial construction, and they use high-density spray insulation roofing foam in commercial or industrial construction projects. Open-cell foam is a soft low-density material, and contractors generally use it for interior applications, including attics, basement walls, crawlspaces, and wall cavities. The open cell structure of this type of insulation allows for moisture permeability to help with moisture management. Open-cell foam insulation, which you can typically install at a lower cost per square foot can accommodate long-term creep and seasonal movement. It also provides sound dampening qualities, ideal for use in rec rooms and theater rooms. On the other hand, closed-cell foam is a more rigid, medium-density material, and you can use it for exterior applications like continuous insulation applications and interior applications. This kind of insulation boasts a higher R-value per inch making it ideal for small areas that often require the highest possible R-value to meet building code requirements. While closed-cell foam has a higher per board foot cost, there are numerous advantages. For starters, you can apply closed-cell foam at extremely low temperatures, and it has higher tensile and bond strength. Additionally, this type of foam adds wall racking strength, impact resistance, and has a lower vapor permeance. One of the most significant differences between traditional insulation and polyurethane foam insulation is spray foam’s ability to air seal and insulate. SPF insulation provides an air barrier to wherever you apply it to help prevent air leakage from a building. Air sealing a building’s envelope with SPF insulation also helps address moisture entrance to minimize mold and mildew growth risks, as well as prevent ice dams formations in colder climates. Spray insulation reduces air infiltration, too, and helps limit moisture vapor from entering and escaping a building, reducing the load on HVAC systems. In fact, whether you are retrofitting a structure or selecting insulation while building a new home, SPF insulation is one of the best ways to increase energy efficiency and improve interior comfort. As an SPF contractor, it is important to understand that there are some homeowners and commercial building owners who are not familiar with the advantages of SPF insulation. Flexibility to Fill Gaps and Leaks. SPF insulation is flexible. It fills cracks and crevices easily that would otherwise be difficult to access with other insulation materials. Therefore, it has the unique ability to eliminate drafts and leaks in homes and buildings. This factor is critical, considering recent studies that reveal a home loses about 40 percent of its energy when air escapes via windows, walls, and doors. Better Protection. Polyurethane foam insulation creates a seamless, durable layer of protection. It also provides a strong barrier that shields a building from hot and cold, and from water damage. Its R-value per inch is 6.8, which surpasses any other known insulation material available on the market today. Utility Savings. Foam insulation is popular among building owners because of its ability to help lower energy consumption. 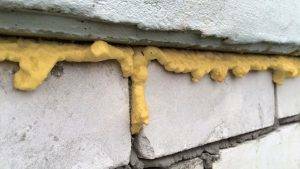 If you have additional questions about polyurethane foam, please contact us or call 1-866-652-9975 today. You can also visit our online store to find everything you need to complete spray foam insulation jobs.